Russian teenagers visited Sanya Dongtian Park on the morning of March 26. 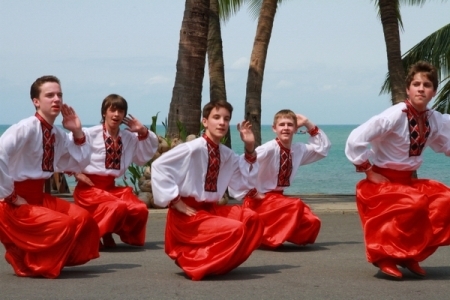 Russian teenagers performed cheerful and enthusiastic Russian folk dances and Gypsy Dancing for the tourists. The 6th 8-day Sino-Russian teenagers’ technological & cultural exchange activity, co-organized by the governments of China and Russia, kicked off in Sanya on March 25, and more than 30 Russian teenagers visited Sanya Dongtian Park on the morning of March 26. Russian teenagers were very interested in Mesozoic ancient fossils, Hainan algae fossils and the thousands of famous pieces displayed in Sanya Museum of Natural History at Dongtian Park. At the end of the visit, the Russian teenagers performed cheerful and enthusiastic Russian folk dances and Gypsy Dances for the tourists. During the next seven days, teenagers will visit Sanya Dance School, Qiongzhou University and the No.1 Middle School of Sanya. The Sino-Russian teenagers’ technological & cultural exchange activity has been held in Beijing, Shanghai, Moscow and St.Petersburg since it was started in 2005. It aims to enhance mutual understanding and friendship between teenagers of the two countries.